In this lab, VoIP and Data communication has already been configured over a single physical network in each of the buildings using multiple VLAN. Data communication has been also established between each building as well as the Data Center. Your task is to configure VoIP communication between the two buildings using Dialing Peers. A dial peer, also known as an addressable call endpoint, is a device that can originate or receive a call in a telephone network. In voice over IP (VoIP), addressable call endpoints can be categorized as either voice-network dial peers or POTS (plain old telephone service) dial peers. 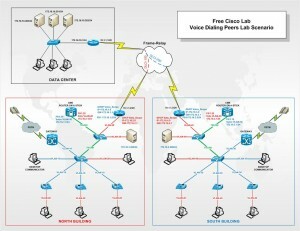 Voice-network dial peers include VoIP-capable computers, routers, and gateways within a network. POTS dial peers include traditional telephone network devices such as phone sets, cell phones, and fax machines. The term dial peer is sometimes used in reference to a program that matches a specific dialed sequence of digits to an addressable call endpoint. According to this definition, there is one dial peer for each call leg (connection between two addressable call endpoints).